Powder room. | House by the water. I nearly didn’t write a post for the powder room, but then I thought it was mean-spirited to deprive you of these inspiring pictures. Here’s my top 5. Light and simple. Image source: The Style Files. 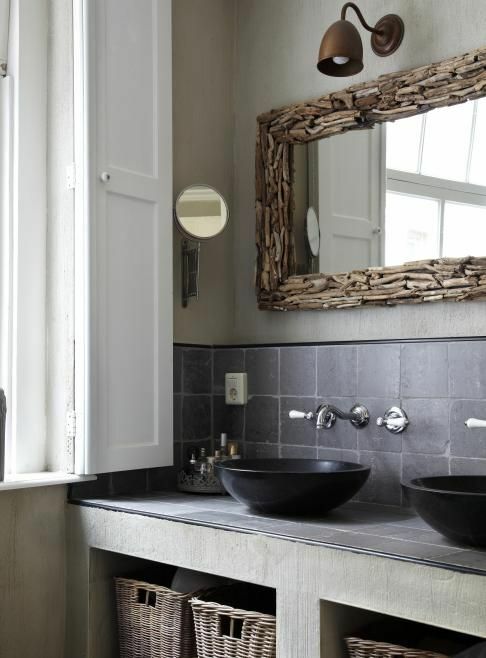 A dark grey and the wood seem to make this powder room masculine. 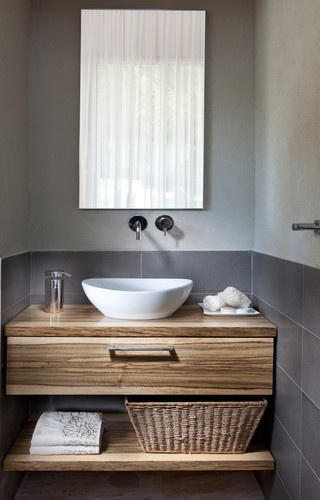 Photo credit: Segev photography, via Houzz. Light and airy, despite the smelly boots. Source: The Style Files. Darker tiles for the splash back works nicely with black. Source: RTL Nederland. You know fancy floor tiles make me weak. (I still haven’t discounted them from the laundry). Cute nautical touch for the mirrors. Source: E-mag DECO. Our powder room is the only bathroom on the ground floor. It will be for guests, but it will also be used by the youngest little pig who will sleep in the downstairs bedroom. Dangerous, I know. 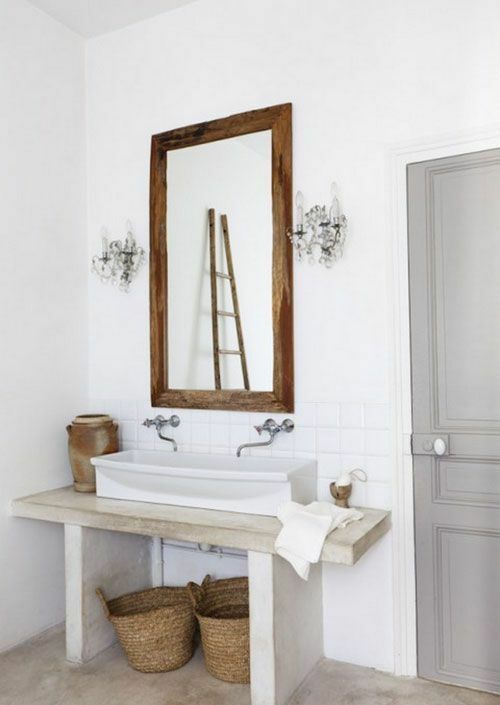 I’m trying to forget about smelly socks, and worse, in order to plan a guest-worthy powder room. Nothing fancy. Needs some decoration. We will have an external door where the window is, so that dripping wet bodies from the pool don’t walk through the living areas to visit the loo. 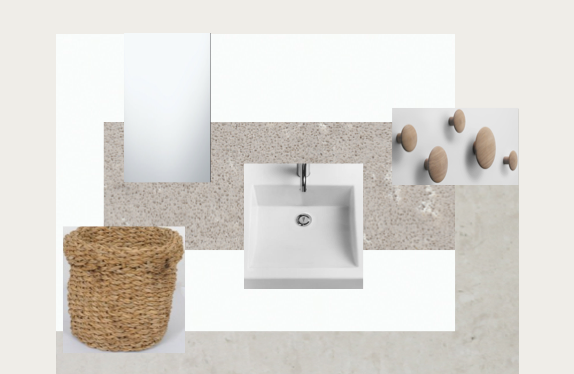 I’m going to try and tie the laundry and powder room together in terms of colour, although the laundry will have a Laminex bench top while the powder room is going posh with Caesarstone. Travertine white honed tile (National Tiles) – I need to find something similar from one of our builder’s tile suppliers. 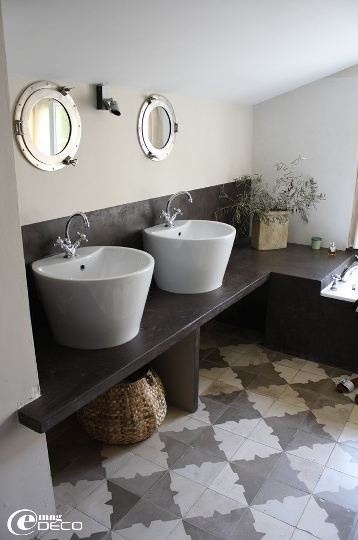 Builder supplied mirror and basin. Some very cute wooden dots that you can hang clothes and towels on from Muuto. In order to bring the laundry and powder room together, I now think I’ll have to modify my laundry plan a bit. The floor tiles are too dark. Phew. That’s it for tiled rooms. I’m fully prepared for my “pre start” meeting now. 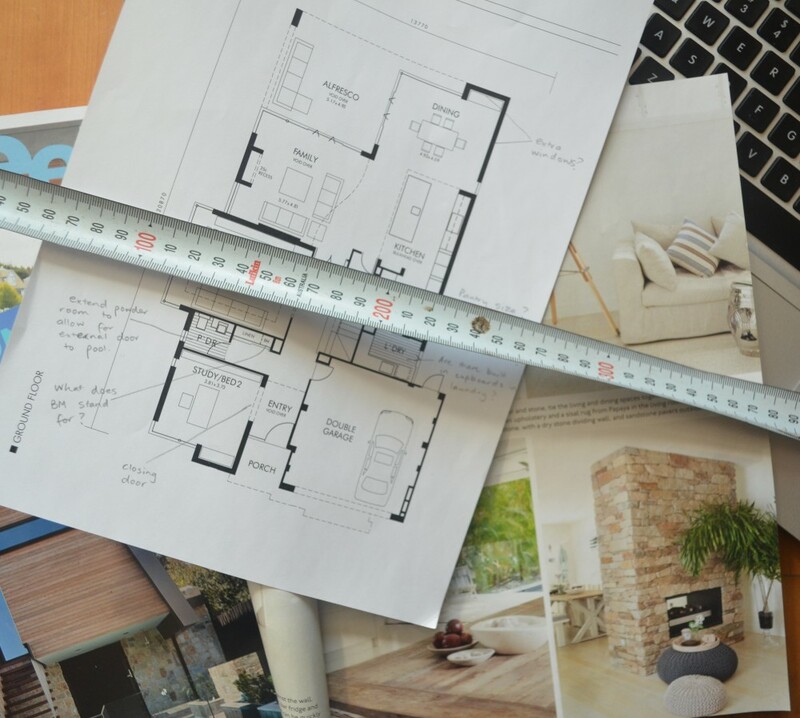 I will be happily swayed by good advice from the builder’s interior designer, but it will be for the smaller details. The basic mood/colour/theme for the bathrooms, laundry and kitchen is established. This should help me avoid making any on-the-spot decisions that I later regret. What about one of those wooden bath mats for the pool season so you don’t have to stand in pools of ‘water’ to use the loo. http://www.ebay.com/itm/Bathroom-Shower-and-anywhere-Solid-Teak-Wood-Mat-Slip-Resistant-/290875467853 ….a project for Igor. Plantation shutters might look nice in there too….although you aren’t having any of those anywhere else are you. A feature mirror would make a big difference too. Yes to wooden bath mat. I was thinking of one of those for the main bathroom, but it would be good in the powder room, and maybe outside the external door too. Yes to shutters (not 100% sure of our external door type, but I think it is glazed). We plan to have plantation shutters in the kids’ bedrooms and the other bathrooms. Yes to feature mirror, might have to get some tips from creative sister about that later. 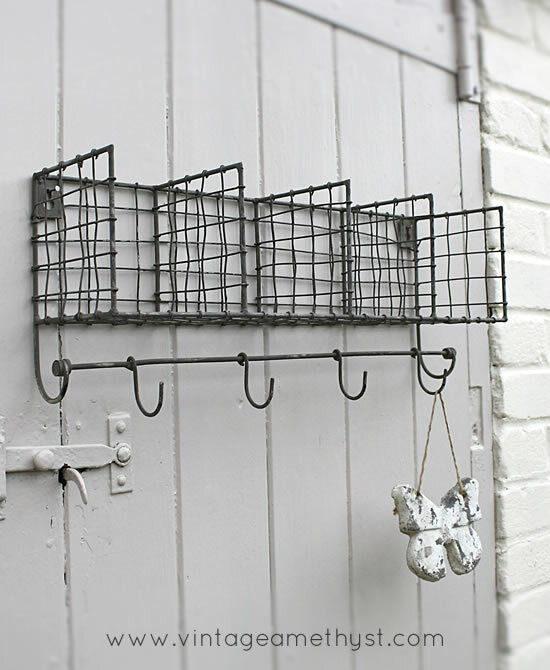 Not sure about cute shelving… will keep it pinned in case. Keep up the good work! 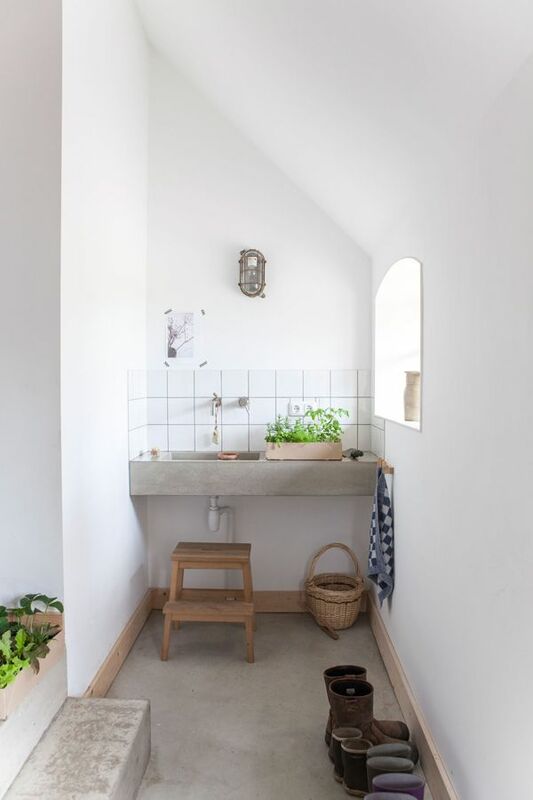 I love the concrete floor look, and if I had a new house — or indeed one somewhere warm! — I’d jump at some of these options 🙂 nicely chosen. I love your mood board! What do you use to put them together? Hi Trixee, I asked a few other bloggers that very question. The answers I got were software I didn’t own. In the end I had a go just with powerpoint. I’m not the world’s most technologically advanced blogger, but it seems to work OK for me. Ah OK, thanks – I was hoping there was some magical online tool that would put one together for me! I had a go at doing one for my powder room too (I edited the post to add it) but it’s a lot harder than I thought it would be! I tried Olio board online, but it seemed too restrictive. Powerpoint is fine when you get the hang of it, but it can be time consuming. Thanks for that link, I’ll check it out! I think the first one is my favourite too. I love baskets in any shape or form and use them whenever I can. Interesting that your bedrooms are on different levels of the house. Unfortunately, in this country, security is quite an issue and has to be taken into consideration when building or designing a house. We tend to group all bedrooms together, often in a way that can be locked off from the rest of the house at night. Africadayz, sadly I know what you mean. We currently live in Brazil (while our house is being built) and the situation is the same.